Back on December 11 I wrote that, to my surprise, the financial sector seemed to be staging a real comeback. At that time I pointed out that the ETF Trend Performance Report indicated that a group of financial ETFs had shown the biggest improvement in trend scores for the week. 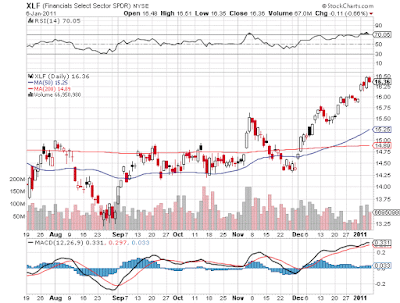 Feeling some skepticism about the financials I was not surprised to see them pull back the very next week. After running tonight's Alert HQ process, the Thursday ETF Scorecard shows that the financials have not only rallied since then, they have established strong bullish trends. Six of the top 10 are financial ETFs and there is another one at position 19. Sitting a bit further down the list at position 19 with a trend score of 5.5 out of 6 is the iShares Dow Jones U.S. Financials Index Fund (IYF). If you are one of those who thinks the market can't make further meaningful gains without the participation of the financials, it looks like you can breathe a sigh of relief. On the other hand, if you are pessimistic on the outlook for the financials, tonight's results are an indication of how extended the market has become with the worst sector finally getting its time in the sun. In any case, the financials have momentum and now we even have a Republican member of the House planning to sponsor a bill to repeal the Dodd-Frank financial regulatory law that passed a mere six months ago. It's looking like the path of least resistance for the banks is up.